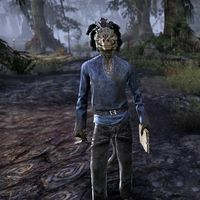 Abijoo-Anoo is an Argonian traveling merchant who can be found traveling the roads in Shadowfen. He travels from where the roads to White Rose Prison and Loriasel meet to western Hissmir. "Abijoo-Anoo, at your service! I bring the best these marshes have to offer! After all, why brave the leeches when I've done it for you?"